Whilst making a brief return to the UK I noticed that The Real Wine Fair was taking place in London, a showcase for organic, biodynamic and natural producers. Thus, I endured a 5.30am start to the day to travel down to London, returning home at 11pm – but it was worth the long day. Above all it was an opportunity to taste outside of my usual wine list of France, wines were on show from all around the world. My plan, therefore, was to taste from these other places to give myself a better context and understanding of wines. I liked the set up where producers were set out across the rooms by country and region. It allowed easy movement and planning, the catalogue was well set out and there were good food stalls available too from the likes of Ottolenghi and Galvin. The seminars were another good feature, I’d have loved to hear Alice Feiring or Jamie Goode on the Sunday but it was a real pleasure to listen to Wink Lorch speaking on the Jura. So these were the wines I enjoyed the most, as ever it was impossible to get round all of the producers I would have liked to visit. Forja del Salnes, Rias Baxas – brilliant wines from old vines Albarino, 13 Leirana Finca Genoveva great concentration and depth (100 year old vines) yet still zesty, 2011 Golliardo A Telleira (60 year old vines at highe altitude) concentration, rich flavours but still clean. Red 13 Bastion de la Luna Tinto (Caino, Espadeiro and Loureiro grapes) – pure red fruits. Thörle, excellent range, the dry Rieslings were all good especially Saulheimer Kalkstein 14 and impressive Schlossberg 14 (slate dry mineral). The Kabinett Riesling 15 was gorgeous, green apple with 56g of residual sugar. Spätburgunders too especially Kalkstein 14 and the single parcels 13 Probstey and 13 Holle with good concentration and depth. I said hello to Messrs. Tscheppe and Muster but did not taste due to time pressures as I had tasted their wines in Montpellier at Les Affranchis. They remain top of the class for me. Warnung, 2013 Skin Contact Grüner Veltliner and 13 Riesling Berg especially the latter with spicy freshness. Nice Portuguieser Feldspiel 13 with round fruit and 13 Etsdorf Blauer Zweigelt, a rosé wine with citrus freshness and white fruit flavours. Revasashvili, 15 Chinuri clear pear / apple fresh and textured. Testalonga, lovely range. El Bandito skin contact 15, lovely Chenin Blanc, apple fruit and clean. Sweet Cheeks 15, Muscat d’Alexandrie skin contact, dry, fruity clean (impressive for a grape which can become very blousy). 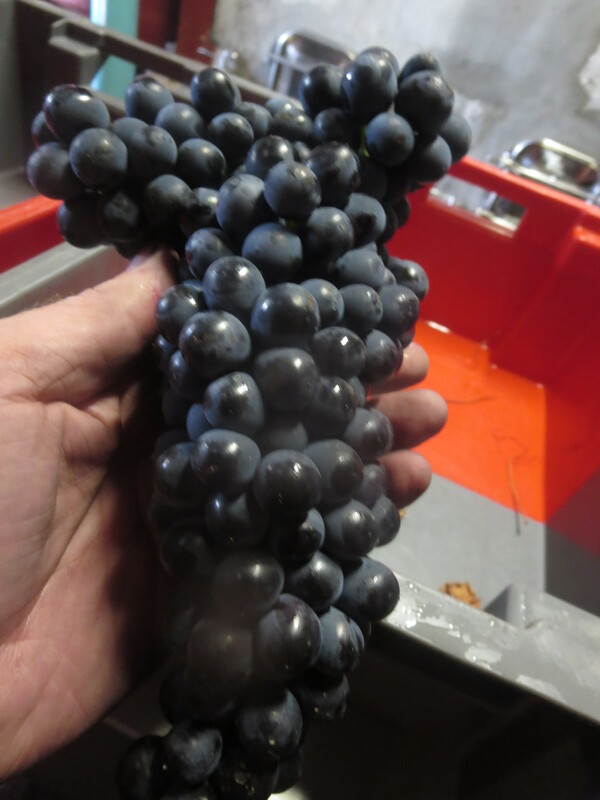 Dark Side Syrah 15, spicy, coloured. El Bandito, Mangaliza apple and pear with lovely balance. Keep On Punching 15 Baby Bandito, Chenin, stainless steel dry, fresh clean apples. Baby Bandito Follow Your Dream (Carignan) 15, fresh, spicy light. Very keen on these wines from Craig Hawkins, a good man to talk with too. La Garagista, Vermont – Unusual varieties due to climate. Harlots and Ruffians 14 – Frontenac Gris 5 weeks contact but nice and fresh. Frontenac Noir (related to Aramon) in Loups Garoux 14 lovely aromas but a bit foxy and wild. Overall impressions. Well it was good to see how the world of wine is being influenced by organic, biodynamic and natural ideas. Whatever your thoughts about these influences they are making winemakers think about the way they produce wines. Interesting to see how producers as far afield as Oregon and Georgia, South Africa and Wales have embraced similar ideas and thinking, encouraged by events such as this no doubt. There were some negatives for me. Skin contact is fine and clearly very fashionable for white wines. However, there were a lot of clumsy wines made in this style with overlong maceration or over extraction. They ended up tasting harsh and lacked fruit or freshness.I know some people like that, but not for me. 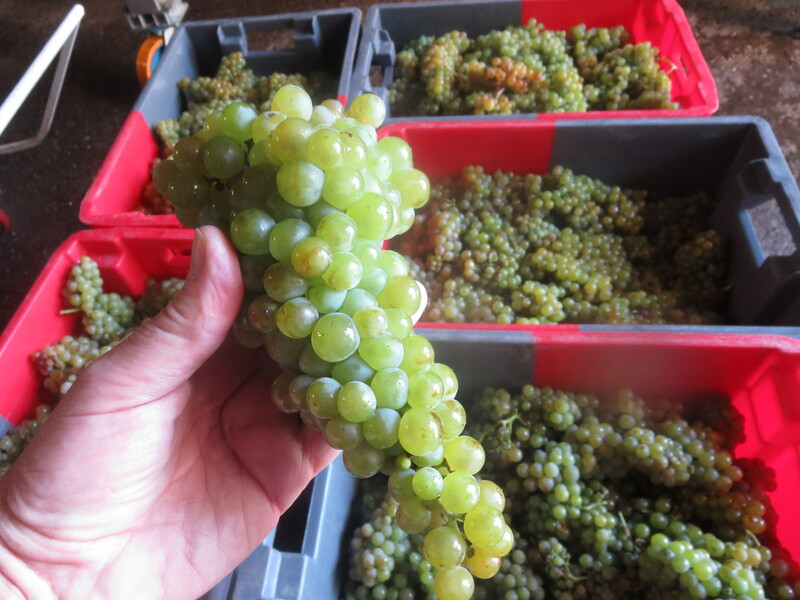 Other producers did long maceration but kept fruit, freshness and balance. Maybe it is a learning process but I had really heard enough about skin contact wines by the end of the day. There were also some reductive wines, others with brett and mousiness. However, these were few in number in a Fair where I tasted over 300 wines. Categories: Tasting, Wines | Tags: Alexandre Bain, Ambyth, Bitarishvili, Buisson, Clos Saron, COS, Craig Hawkins, de la Borde, De Moor, Derain, Domaine des Miroirs, Foillard, Forja del Salnes, Hervé Souhaut, Jura, Kagami, Kelley Fox, La Stoppa, Lapierre, Mandidli, Mouthes Le Bihan, Occhipinti, Okro's Wines, Princic, Real Wine Fair, Revasashvili, Roc Des Anges, Romaneaux-Destezet, Schnabel, skin contact, Testalonga, Thorle, Vodopivec, Warnung | Permalink. On Peut Pas Vraiment Dire Que * is a new cuvée from Mas Coutelou in 2015. So how is a new cuvée born? This is its story. My favourite Jeff wine over the years has been La Vigne Haute, a pure Syrah coming from the vineyard La Garrigue. This vineyard has a small ridge running west to east meaning that part of it faces north and part faces south. Jeff planted Grenache on the southward side as Grenache is a Mediterranean grape and likes the heat. On the north side is Syrah, a grape from the Rhone, which likes heat but not too much if it is to reveal its best. La Vigne Haute is a wine of subtle Syrah. Perfumed with red fruits and tasting of silky smooth red and black fruits it carries elegance and restraint. However, in 2015 Jeff took the decision at the last minute not to make La Vigne Haute but rather to change the whole vinification of the grapes which were harvested. Here is the story in his own words, as told to Paco Mora a caviste in Ivry sur Seine. Jeff kindly gave me permission to reproduce it here. “To thank you [for a generous comment on Facebook], I’d like to take a few minutes to tell you the story of “On Peut Pas Vraiment Dire Que.” A story which confirms that to make wine, we must first know, love and pamper both vineyards and grapes.  On the north side: Syrah (planted north / south) to be always caressed but never assaulted by the sun. 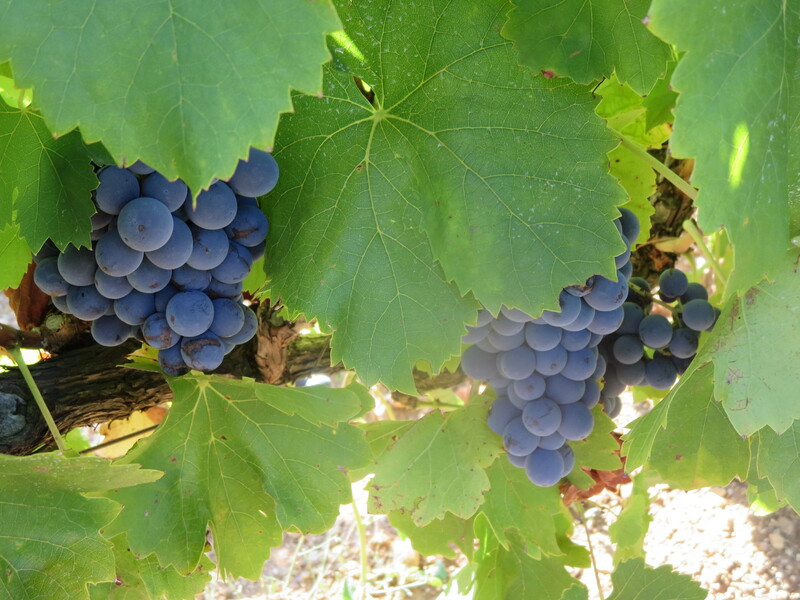  On the south side: Grenache as it is not afraid of the heat. This decision made me lose 10 vine stocks per row of vines (300 in total) to leave a buffer zone between the two varieties but it was a decision which seemed most suited to making the Syrah I dreamed of. It normally makes “La Vigne Haute” but also produced “PAF La Syrah” in 2012. This plot has a vein of water running underneath which the presence of horsetail fern confirms. This year, even during the heat wave, it never suffered and continued to push …. It was the most beautiful vineyard at harvest time. The day of the harvest, we had planned to make Vigne Haute by implementing the classic method; destemmed grapes, putting it into tank, maceration of 2 to 3 weeks with little pumping, to encourage infusion and not to seek extraction. The vineyard was beautiful, beautiful grapes, everyone at the winery was excited that this would be a great vintage. The first grapes arrived, and as son as I saw them, I thought I had to change everything … .. The fact that they had not suffered from the July heat wave but instead had profited from it (because of the sun caressing that north facing slope, the heat effect lessened because of that vein of water). 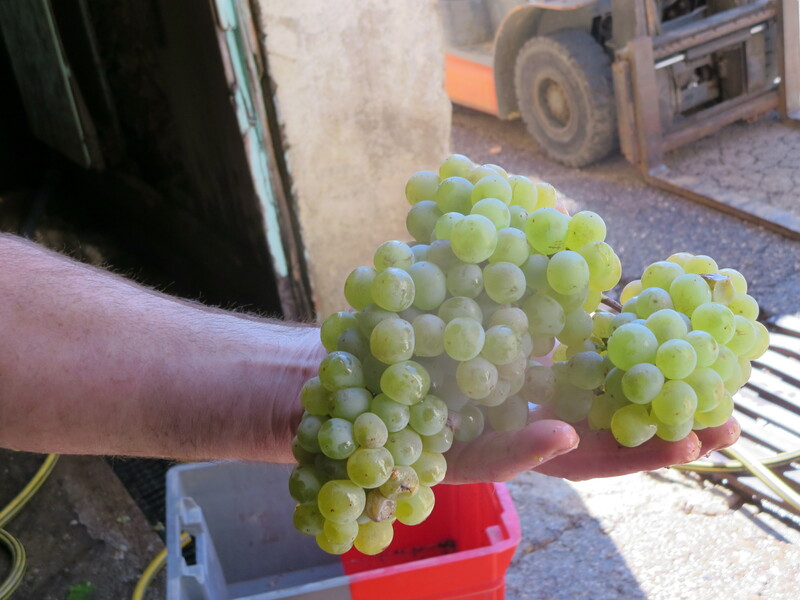 It had produced berries more swollen than usual … and I could really see that when they arrived in the cellar. After an hour, I said to myself “if you do as usual, you will not get to do what you want.” The fact that the liquid / solid ratio is different, if I had made a classic wine, I would have to extend the maceration time to extract enough material relative to the juice and in that case, there is also the risk of extracting good but also the less good. So within 10 minutes I decided to change everything. We continued by putting whole bunches into tank with the idea of making a short vinification. On that day, everyone was down in the mouth in the cellar because I had told them that there would be no Vigne Haute …. But I trusted my grapes and they told me that they would repay my faith in them . We just left the grapes in vats for 7 days without any intervention and then pressed. So there was almost no exchange between the skins and juice in tank. 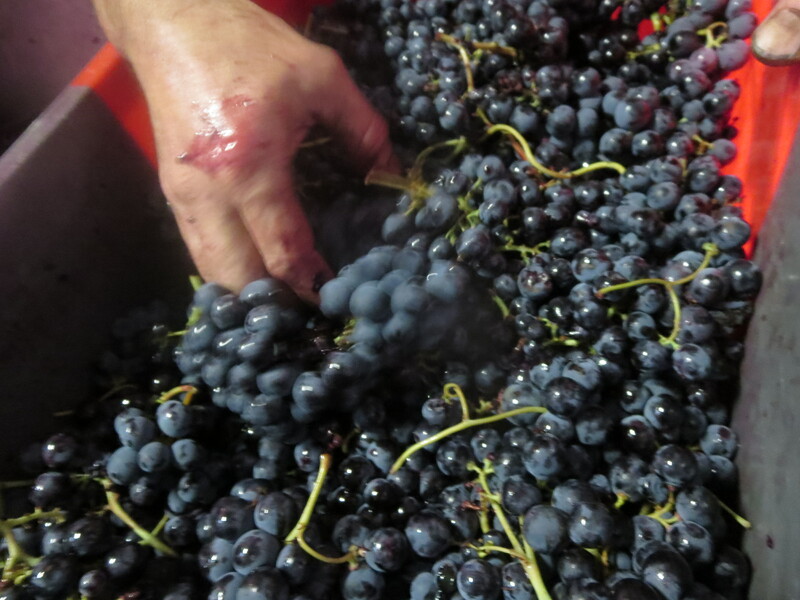 The tannins and colour were extracted because of pressing the skins, which were ripe, and released them after their short stay in the vat. In the end, it’s just the juice of the vine and the terroir that you have in the bottle …. So that is the story of On Peut Pas Vraiment Dire Que. I was one of those who was ‘down in the mouth’ on that day when Jeff changed everything. Yet it was, of course, the right thing to do. The wine is very like the Paf of 2012, fruity but with a lovely vein of soft tannin and bite running through it. It is elegant above all, a Syrah worthy of the great Rhone appelations but with Languedoc warmth and fruit. And OPPVDQ is a tribute to the talent, intuition and knowledge of Jeff Coutelou. He knows his vines, his grapes and how to help them to express themselves to maximum advantage. I can’t really tell you how he does it… it’s natural. * A phrase which can be translated as ‘we can’t really say’. Categories: Vignerons, Vines, Wines | Tags: Grenache, La Garrigue, La Vigne Haute, On Peut Pas Vraiment Dire Que, OPPVDQ, Paf La Syrah, Syrah, vinification, Whole bunch | Permalink. In September I published my 100th blog post. To celebrate Jeff gave me permission to make a special cuvée. 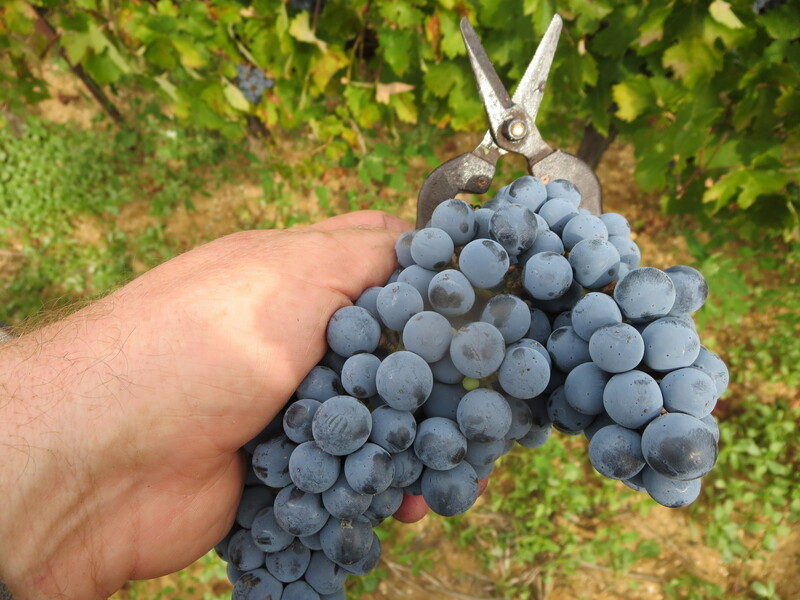 My wife Pat, friends Martin, May, Céline and Delphine helped me to pick Grenache grapes from my favourite vineyard, Rome. An assemblage of Grenaches Noir, Gris and Blanc was made. Since that lovely day the wine has been gently maturing in a variety of containers. Some went into a 60l barrel, more into a 30l barrel and the rest went into a 27l glass bottle. We tasted the barrel wines in November as they were still fermenting and it was already clear that there were differences between them. Further tasting in February revealed the differences more clearly with surprising results. I had expected that the newer oak barrel would have a more pronounced effect upon the wine than the older barrel. Take a look at the two glasses in the photo, clearly one of the wines is a darker colour than the other. So is the darker colour from the older or newer barrel? (Answer lower down the page). On April 7th we carried out a soutirage to remove the dead yeast cells and other material which had served its purpose in the fermentation process but might now hinder the wine. There was actually little of that material as the pressing I made in September was a small scale one using the vertical press, meaning that the wine which went into the containers was actually quite pure grape juice. I expected the older barrel to produce the darker wine but it was actually the reverse. On reflection I should have realised. The older barrel is more seasoned and the staves of the barrel are more saturated from years of wine, creating an effective barrier to oxidation. The newer barrel certainly doesn’t leak (thankfully) but allows more oxygen into the wine, producing the darker colour. As to flavour and aroma. Well both barrel wines are both very pleasing. The older barrel certainly had fresh raspberry aromas with other red fruits, also a sweet edge which carried into the taste. It still has residual sugar but there is lovely red fruit and great length. The newer barrel gave a rounder flavour, still some sugar but there was a hint of spice and darker fruits. The glass bottle was actively fermenting when we opened it. Take a listen. Naturally the wine contained a little gas when we tasted it, but had very fresh aromas and flavours of red fruit with the sugar obvious due to the fermentation. 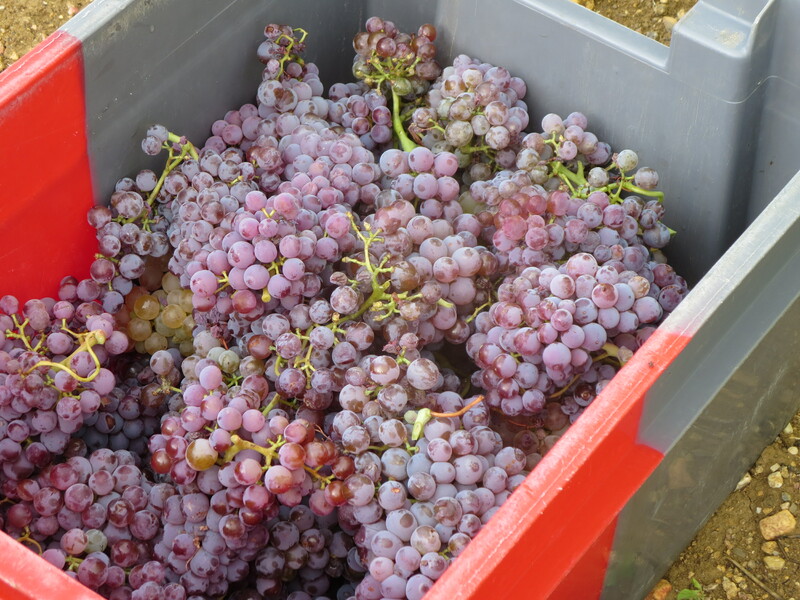 Now they are back in their various containers, topped with a little surplus Muscat to fill them. They will continue to eat the sugar and to develop their flavours. As this is almost the 150th article I hope that it won’t be another 50 before I get to taste them again. Thanks again to Jeff for allowing me to make this wine and to learn about what influences a wine and its development. Categories: Wines | Tags: Grenache Blanc, Grenache Gris, Grenache Noir, oak barrels, soutirage, wine ageing | Permalink. There are three main aspects to the life of a winemaker and it’s time to bring you up to date with all three. It is a lovely time of year to be in the vines as they start their growth for the year, buds of striking colour, first leaves and greenery. In Rome vineyard on April 10th there were butterflies, birdsong and bees, beautiful. Taille is complete, ploughing completed (for the moment) and we have even had some rain at last which has encouraged the growth we see in the vines. However, it’s not all green for go. The buds are fragile and any more high winds could cause some damage to them leading to reduced yields in September. Moreover, Jeff pointed out another problem. Some of the buds are actually auxiliary buds (contre bourgeons) which would reduce yields further. The contre bourgeons generally don’t yield fruit and also take energy from the main buds so these don’t grow to full height. The winter saw not one single day of frost in Puimisson, the vines were restless and unable to sleep in the face of cold weather. Therefore sap, which should be still, continued to flow and with mild temperatures in January and February the sap nudged the buds. However, a cooler spell at the end of February and March meant that the sap retreated a little and the buds were left stirred but not able to unveil themselves. As warmer weather returned the sap nudged auxiliary buds as the main buds had already seemingly started. In fact they may not now emerge at all and it is these auxiliary buds which will be left. Something to raise concern at a preliminary stage of the season. The vines generally are starting well but a few have this issue. More importantly the vines have had little rest, will they be able to offer their best in 2016? Nonetheless it was good to see the newly planted vines in Font D’Oulette are already budding, a promising start. The 2015 wines made for early drinking, e.g. Vin Des Amis, PM Rosé and Classe, have been bottled and dressed (habillage) with their labels. Other cuvées are still in tank resting after fermentation, maturing towards wines such as Flambadou. Soutirage was carried out on some of these more complex wines as reported in the last article. Meanwhile Jeff continues to taste and to check their progress, to ensure the quality and health of the wines. Some wines from previous vintages have been bottled, for example the new barrel aged Maccabeu / Grenache Gris wine ‘5J’. New labels have been designed for these and they will eventually become rare treasures for followers of Mas Coutelou wines. One new wine is the Syrah ‘On Peut Pas Vraiment Dire Que’ and I will be narrating its story in a coming article, a story which reveals again the vinification skills of M. Coutelou. It is all very well making good wines but, if you are to continue as a winemaker, you must be able to sell them. Jeff is in the position of being able to sell all of his wines and he could sell much more if he had it. That is the result of years of great wines which people want but also his ability to sell it. He has built loyal buyers around the world, often former students from his days as a teacher in Paris, for example his importers to Paris and New York, Fleur Godart and Camille Rivière. However, Jeff still attends salons such as Les Affranchis in Montpellier, La Dive Bouteille in the Loire and, last week, La Remise in Arles (again more about La Remise soon). He was very happy with the salon and sold more wine, Vincent was regularly spotted carrying cases from the van to various cars! Last Wednesday palettes of wine were sent to Paris and it was good to see Paco Mora, whose Cave d’Ivry is a loyal customer, publish some photos of their arrival. He looked happy and was very complimentary about Jeff’s skills and the new syrah. So, there we are. It’s a busy life being a vigneron. Jeff has lots of paper work and admin to carry out this week as well as spending time in the vines. All with a bad back which he has nursed for several weeks. As you sip, or quaff, your Mas Coutelou wine (hopefully) spare a thought for the work which has gone into the wine in your glass. Categories: Vignerons, Vines, Wines | Tags: 5J, bourgeons, Camille Riviere, Cave D'Ivry, contre bourgeons, Fleur Godart, Font D' Oulette, habillage, La Remise, Mas Coutelou, On Peut Pas Vraiment Dire Que, Paco Mora, Rome, soutirage | Permalink. Soutirage is known as racking in English. After the wine has fermented the tank or barrel will contain the lees (dead yeast cells) and sediment. The yeast fermented the wine, lees have added flavour and some antibacterial properties but if left in contact with the wine they will start to add off flavours, cloud the wine and generally hinder the final wine. The process is carried out as gently as possible, using gravity rather than electrical pumps. So on April 6th Jeff messaged me to say that the day had arrived to carry out soutirage of the wine I made for my 100th blog post and the vendanges tardives Grenache we picked on the last day of the vendanges. We started with the Grenache. A tube was placed into the stainless steel tank, suction applied and the wine flowed gently into large 15l bottles. Jeff chose clear bottles so that he can watch the progress of the wines. They will be stored in his cellar in the dark so no problems from light damage. 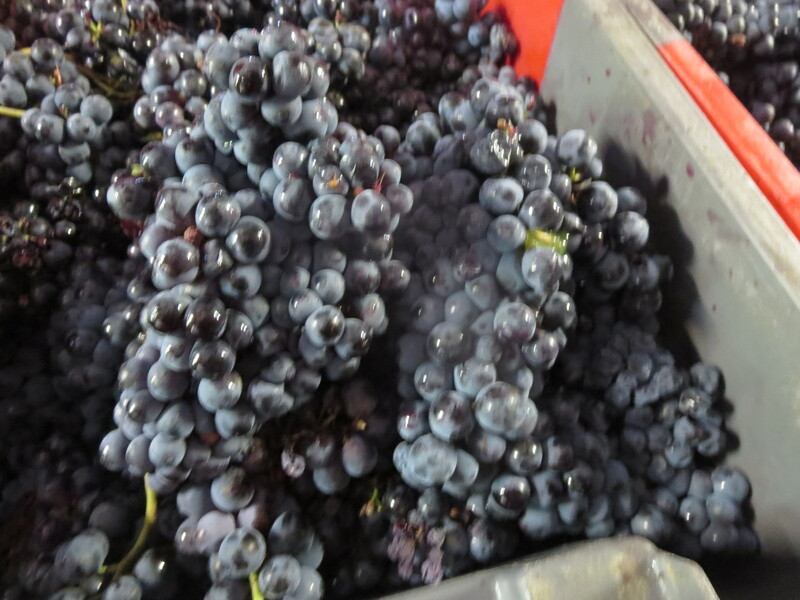 The Grenache still contained some residual sugar, was sweet, fresh and clean. It was appropriate that we also racked the maceration white wine. Cameron had taken the lead on this wine and he was here after attending La Remise, the natural wine salon in Arles, I’ll be writing about soon. The wine was fresh, lots of fruit and also a light texture from the 4 month maceration. Very good. And then the 3 Grenaches wine I took charge of. Most of this has been aged in barrels so the soutirage ended with them being emptied of their sediment. There wasn’t that much sediment as the small vertical press I used controlled what entered the barrels, ie mainly juice. Naturally we had to top up those barrels after soutirage to replace the volume taken away. And now they continue their gentle ageing. I am very happy with the progress of the Grenaches, again more soon. A fascinating day, another new process in winemaking for me to learn. Categories: Vignerons, Wines | Tags: Grenache, lees, Racking, soutirage | Permalink.